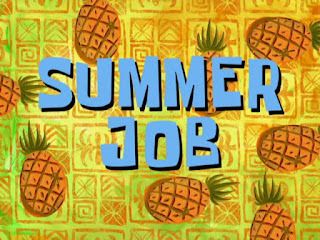 With September approaching so quickly, you might have thought about applying to some of the on campus jobs listed on our Career Services Job Posting Board. Working on campus is a great opportunity – with perks like flexible hours, a convenient location and competitive wages they are an attractive option for students looking for work. But, what if you see this thing at the top of a job posting? 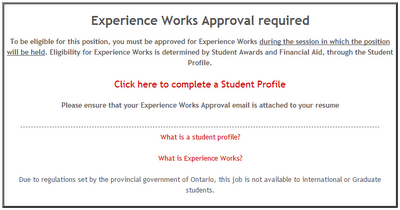 This indicates that you need to be eligible for the Experience Works program to apply to specific jobs. Experience Works enables students to build their transferable job skills by providing funding to faculty and staff to hire students for on-campus positions. To be approved for this program, you must complete a Student Profile and your eligibility will be determined by the Student Awards & Financial Aid office. You will receive an email letting you know if your profile has been approved or not usually within 1-2 weeks depending how busy the office is. If you’re approved, you will obtain a valid Experience Works Approval email that you can attach with your application to Experience Works jobs. Don’t forget! 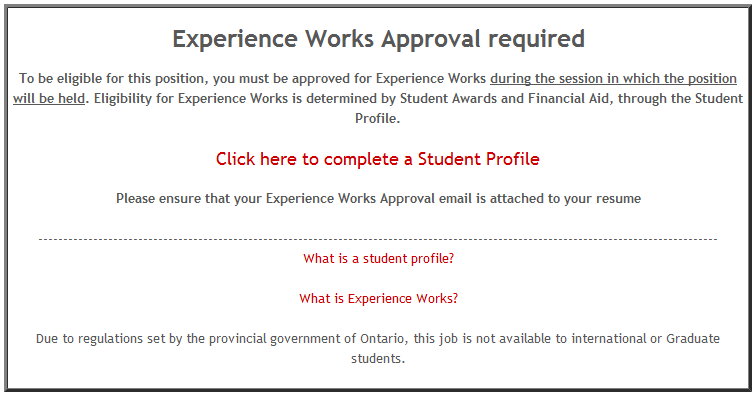 You are required to re-apply for Experience Works each term. To find Experience Works positions visit the Career Services site.